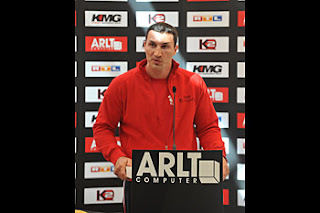 Monday was the final press conference for IBF, WBO, IBO, and Ring heavyweight champion Wladimir Klitschko (57-3, 48 KOs) and former WBC champion Sam Peter (34-3, 27 KOs) ahead of their championship fight and rematch from their 2005 fight this Saturday, September 11th at the Commerzbank-Arena in Frankfurt, Germany. Peter celebrated his 30th birthday on the day of the press conference and was presented with a cake made out in the design of of boxing ring, and a belt by Klitschko. 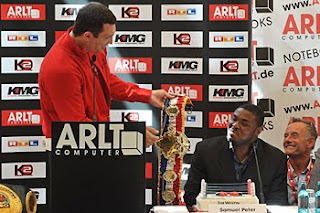 I'm not sure what the belt part was about but I think it might have been a jab at Peter regarding to not getting his belts, and/or possibly in reference to the situation in his brothers press conference with Peter in which Peter tore away the belt from Vitali's hands. "Anything can happen in the ring. A knockout can happen every second. 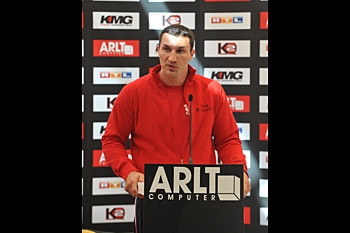 Wladimir tried to provoke Peter by saying, "This is your special day. That's why I'll let you touch the belt and let you hold them, but only today and that's about it. 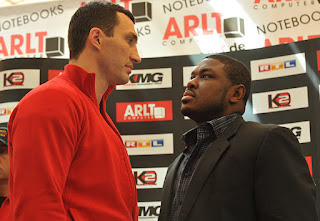 Wladimir held the IBF and WBO belts right before Peter's face. Peter said nothing. "I'll give the answers in the ring. I'm going to let my fist speak in the ring and I'll take the belts. This fight is going to be classic." "I can't wait, and I don't want to say alot because you will see it all in the ring. Watch out and don't miss it. Thank you everyone and especially God. In 2005 I was doing well but people thought my career was over - I knew that this was not the end, it is not going to be over! I have trust in God and I am back, I'm really happy about it. September is my month and it's my moment especially for my career". "We are going to put the cake into the refrigerator until Saturday, because this is when Samuel will be picking up his real presents - the world champion belts!" 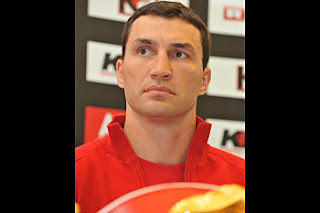 At one point in the press conference he gets up and says ,"Wladimir is going to get knocked out in round 6." "Peter has one of the best knockouts. 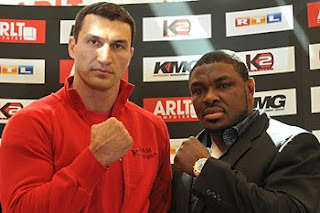 Samuel is an accurate puncher, but Wladimir has been become a complete fighter and is able to control everything. He makes you fight how he wants. He is the best Heavyweight Champion of the World, and he will dominate this fight." Stewards predicts is a 4th or 5th round KO for Klitschko. Here is some video footage of the press conference. Enjoy!